There Might be an LA Noire Sequel. Some Day. 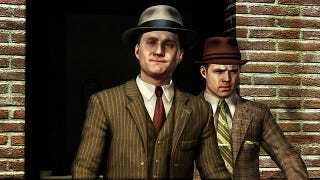 With its original developers shut down and with a story that ends rather conclusively, you wouldn't think Rockstar's LA Noire would be in line for a sequel. But it might be. Maybe. A Rockstar representative writing on the company's official site has posted "don't count out the possibility of a new game in the L.A. Noire franchise in the future". "We simply have not decided anything", they continue. "We're all very pleased with how that game turned out and are considering what the future may hold for L.A. Noire as a series. We don't always rush to make sequels, but that does not mean we won't get to them eventually – see Max and Red Dead for evidence of that – we have so many games we want to make and the issue is always one of bandwidth and timing." Red Dead being the perfect example, what with Redemption and Revolver having common titles, leading ladies and...that's about it.